How Do Semiautomatic Washing Machines Work? For thousands of years, people washed their clothes by beating them against rocks. Fortunately, we live in the era of technology and we can just throw loads of shirts, pants, and bedding into a machine and turn it on---maybe 5 minutes of work to wash laundry that would have taken hours of hard labor to just partly clean 200 years ago. Though this is hotly contested, the Vatican newspaper has even recently declared that the washing machine did more to liberate women than any other development in the 20th century, including the pill and the right to work. But do you ever stop to wonder exactly how it works? What is it that a washing machine does that gets your clothes so white and bright? Sure, there's that great new detergent and stain remover, but it's the washing machine that really does the trick. One type of washer you might not have heard of is the semiautomatic washing machine, which combines the portability of old methods of washing clothes with the technology of today. These washers are designed for smaller spaces and do not require permanent hookups to a water supply, and are popular in India and Asia. For thousands of years, people washed their clothes by beating them against rocks. Fortunately, we live in the era of technology and we can just throw loads of shirts, pants, and bedding into a machine and turn it on---maybe 5 minutes of work to wash laundry that would have taken hours of hard labor to just partly clean 200 years ago. Though this is hotly contested, the Vatican newspaper has even recently declared that the washing machine did more to liberate women than any other development in the 20th century, including the pill and the right to work But do you ever stop to wonder exactly how it works? What is it that a washing machine does that gets your clothes so white and bright? Sure, there's that great new detergent and stain remover, but it's the washing machine that really does the trick. One type of washer you might not have heard of is the semiautomatic washing machine, which combines the portability of old methods of washing clothes with the technology of today. These washers are designed for smaller spaces and do not require permanent hookups to a water supply, and are popular in India and Asia. A fully automatic washer requires that you only put the clothes in, and returns them to you clean and dry. A semiautomatic machine, by contrast, requires that a human control and oversee the process of adding and draining water. Aside from that, the basic principle is the same: moving clothes around in water and detergent until they are clean, and then spinning them until they are partly dry. Most, if not all, semiautomatic machines are top-loading, meaning you put the clothes in the top of the machine. Top-loading washers use an agitator, which stands up in the center of the wash basin and is designed to move clothes in and out of the water. In some semiautomatic machines, the wash tub is a double-layer unit, with an outer tub that holds water and an inner tub that has holes in it to allow water to drain out. Other machines have two tubs, one for washing and a perforated basket for spin-drying. To start a load of laundry using a semiautomatic machine, the first step is to add clothes and detergent. Then, using a tap or hose, add enough water at the desired temperature to fill the wash tub (see manufacturer instructions for your specific model to find out exactly how much water to add). The agitator, in the center of the wash tub, spins about 3/4 of the way around, and then does the same in the opposite direction. This motion pulls clothes down into the water, which then work their way back up until they get pulled back down by the agitator. Once the wash cycle is finished, you need to manually drain the water from the wash tub. The next step is to add clean water for rinsing, up to the correct water level as specified for your washer. After adding water, restart the washer. It will use the same agitator motion to move the clothes through the water, rinsing the dirty water and soap away and leaving your clothes clean. The spin-dry cycle of a semiautomatic washer uses centrifugal force, the pressure generated when the inner drum or wash basket spins, to squeeze excess water from the clothes. The dry cycle spins at a very fast speed of up to several hundred revolutions per minute (RPMs), wringing as much water as possible from the clothes. In a machine with a single, double-layer tub, you are only required the drain the water from the wash tub before starting the drying cycle. In two-tub units, you will need to move the clothes from the wash tub into the drying basket before starting the spin dry. When the dry cycle is complete, hang the clothes to finish drying. 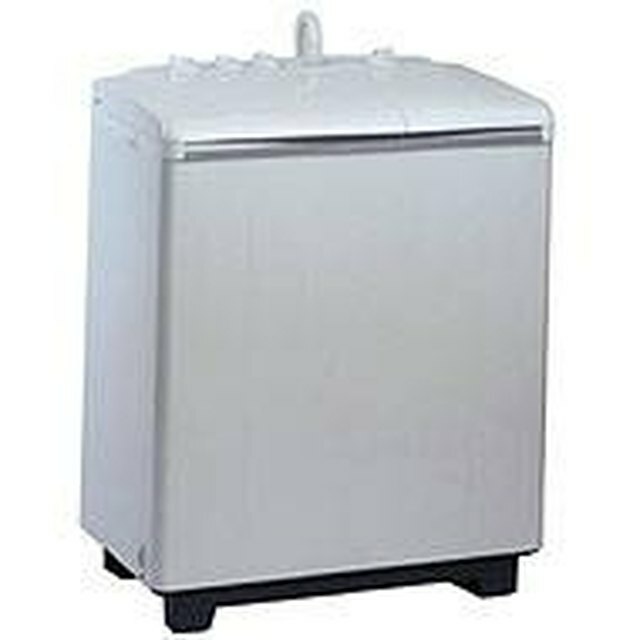 Among the advantages of a semiautomatic washer is that unlike most fully automatic washing machines, most of the components are plastic, so they will not rust. The spin-dry cycle means your clothes dry much quicker than if they were hung to dry without the spin cycle, and the agitator motion of the wash and rinse cycles give you much cleaner clothes than washing by hand. This type of washer is particularly ideal for apartments without built-in appliances, or for any location where it is difficult or impossible to attach a fully-automatic washer to hot and cold water sources. If you are content with hanging your clothes to get them totally dry, a semi-automatic machine can offer a significant cost savings. These convenient units make machine washing available to many people all over the world who would not be able to afford or install a fully automatic washer and dryer.